Fighter | Flickr - Photo Sharing! 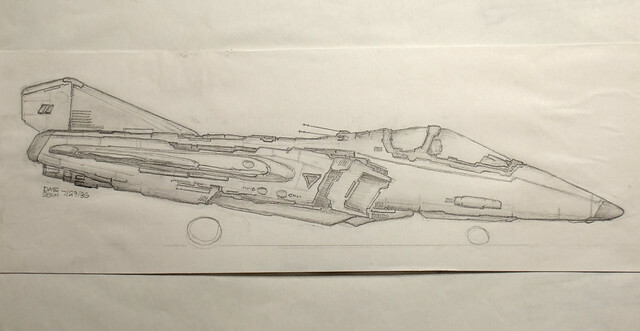 I tended to like drawing fighter aircraft, because the big ships were always a challenge to me. I think it's because I could understand what everything on a fighter did, having spent hours trying to figure out duct routing for the jets and so on. This is one I drew probably in the 11th or 12th grade, after I had finally broken free of graph paper and straight edges. I'm showing an improved grasp of shading and form, though it's still very planar. In terms of influences, it's hard to say...probably a bit of Macross and long-standing conventions I'd developed. The raked-back antenna behind the cockpit, the shape of the tail, and the wing placement are pretty standard. Oh, I just remembered that this was one of the first ships I purposely had "leaning forward" a bit because it looked more aggressive! I would have to adjust the angle of attack of the main wing though to make this work for real.